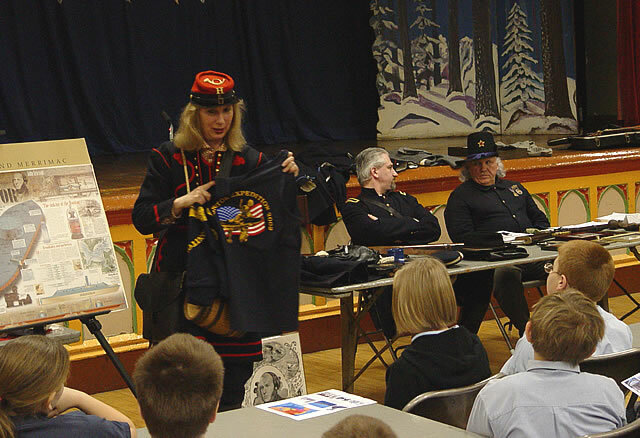 The Greenpoint Monitor Museum "Road Show" St. Stanislaus Kostka School January 23, 2006 The USS Monitor did help save the Union during the Battle between the Monitor and Merrimac. This was the first battle between two ironclad ships. The USS Monitor stopped the Confederate ironclad from destroying the US Navy wooden ships. The USS Monitor later sank during a storm. She was discovered in 1973. The National Oceanic and Atmospheric Administration created a USS Monitor Sanctuary to protect the USS Monitor. Parts of the USS Monitor have been brought up by scuba divers to save them for history. This shirt was from one of these expeditions. The USS Monitor did help save the Union during the Battle between the Monitor and Merrimac. This was the first battle between two ironclad ships. The USS Monitor stopped the Confederate ironclad from destroying the US Navy wooden ships. The USS Monitor later sank during a storm. She was discovered in 1973. The National Oceanic and Atmospheric Administration created a USS Monitor Sanctuary to protect the USS Monitor. Parts of the USS Monitor have been brought up by scuba divers to save them for history. This shirt was from one of these expeditions.